Hanging baskets are back in fashion again. A quick glance on Intagram will bring up thousands of pictures, showing that hanging baskets are throwing off their ‘fuddy duddy’ image and are being embraced by the younger generation. 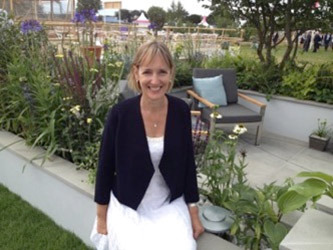 Sales are rising too, increasing by 9% since 2015 according to Squire’s Garden Centres. At Squire’s you can buy lovely ready-planted hanging baskets designed by their plant experts, or why not get creative and make your own? 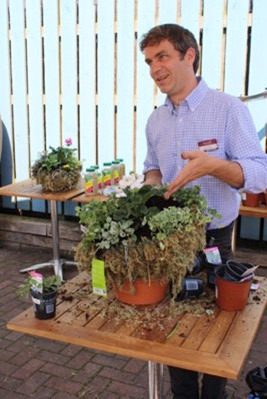 Squire’s Garden Centres is holding a “Large Summer Basket Masterclass” on Friday 17th May at 10am or 2pm. Tickets cost £25, which includes tuition, the basket, soil, moss, and a beautiful selection of upright and trailing plants, as well as a centre piece plant such as a scented geranium or fuchsia. Plus you’ll receive a voucher for a free tea or coffee and slice of cake to enjoy in their Café Bar, and 10% off all plants on the day! Tickets are limited so book now at www.squiresgardencentres.co.uk. Space – perfect for small gardens or if space is at a premium. 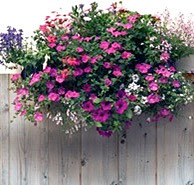 Height – hanging baskets give great colour at eye-level. Wow Factor – they make a real statement in your garden. Convenience – can be moved around easily. Low maintenance – simply water to keep soil moist and deadhead regularly to encourage repeat flowering. Easy to update – by changing the colour or type of plants in your hanging basket you can change the mood or look of your garden in an instant.